Pastor Nigel Morgan, his wife Althea, an office clerk and their daughter, Crystal, poured hot water on Cuthbert Victory, a mason, as part of a “spiritual warfare” on April 9 in Marriaqua, St. Vincent, Jamaica. The three are reported to have held down Victory while their daughter poured the boiling water on his back. The 37-year-old mason, suffered burns to his back, shoulders, chest and face. 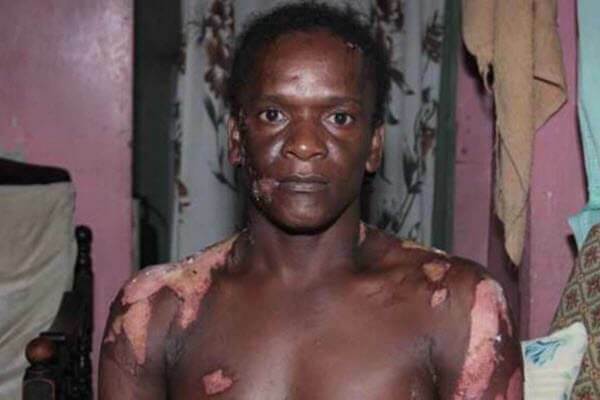 He said he had been told by doctors that he suffered first-degree burns and that the water that was poured on him was mixed with oil. The trio, appeared before Chief Magistrate, Rechanne Browne-Matthias at the Serious Offence Court in Kingstown. They pleaded not guilty and will re-appear in the Mesopotamia Magistrate’s Court in Marriaqua, on April 29. “I hope you all make enough money — you hear?” said Morgan, as photographers too the picture of the family as they left the court building. “I hope you all give an offering to all the churches,” he added. Morgan had earlier told CMC that the incident was ‘a spiritual warfare. “This is a spiritual warfare. It is in the hands of God and he will fight and he will deliver,” he had said then.